I read every other San Francisco City Guide before going on this trip. I checked everything from the weather to the restaurants in the area, and I thought I was ready for the bay area! But, you really don’t know what to expect until you go somewhere! Here I collected the most useful San Francisco tips for your first visit. Be Ready For A Lot of Walking! The first thing I learned is that San Francisco is hilly! Well I knew it was, but I didn’t realized how bad it was until I arrived. The first day we walked straight up a hill as soon as we left our hotel. Only then we found out that there 84 hills in San Francisco and we went up one of the steepest of them. I know that Lombard Street is very famous and gets all the love, but Filbert St. between Hyde and Leavenworth Streets is the steepest, it’s 31.5 degrees! So if you are thinking about bringing a couple of pairs of heels, save the space in your suitcase. You will not go far in this city in heels. Have you heard this quote: “The coldest winter I ever spent was a summer in San Francisco?” The weather in San Francisco really varies because of San Francisco’s hilly landscape. The weather varies by neighborhood and by the time of day. It could be sunny and 70 degrees in SOMA, but foggy and 50 degrees in the Marina District. Wear layers you can easily add and remove and you’ll be fine. I carried a leather jacket everywhere with me in the middle of May and it was perfect! But remember, it can be cold, foggy, and windy in the summer in San Francisco. San Francisco has one of the best public transportation systems I have seen in the US. The Muni bus and rail lines are cheap, but they can be time consuming. There are more than enough Ubers, Lyfts and cab drivers to get around easily. We went from one side of the city to another for under $10 with Lyft. And it was about $25 for a Lyft ride from the airport to our hotel in the Union Square. Parking can be a nightmare in just about any neighborhood in San Francisco. Plus, most hotels don’t offer free parking to their guests. If you plan on staying within the city limits, I recommend skipping the rental. Traveler’s Tip: San Francisco has a lot of options for bicycles and scooters to get around, too. Limebike scooter costs $1 to activate and 15 cents per minutes to rent and it is so much fun to ride! One of the most popular tourist destinations is Pier 39, which you should go to for the experience of it and to see the sea lions. After that, I would avoid it if possible. But Fisherman’s Wharf neighborhood which is nearby and just as touristy is a lot more fun. Places nearby serves some of the best seafood in the city thanks to its proximity to the docks. For dessert, take a walk to Ghirardelli Chocolate Factory and get one of their famous chocolate and hot fudge sundaes. Check out San Francisco’s many neighborhoods If you want to get a real feel for the city, get out of Union Square and downtown to check out San Francisco’s many neighborhoods. 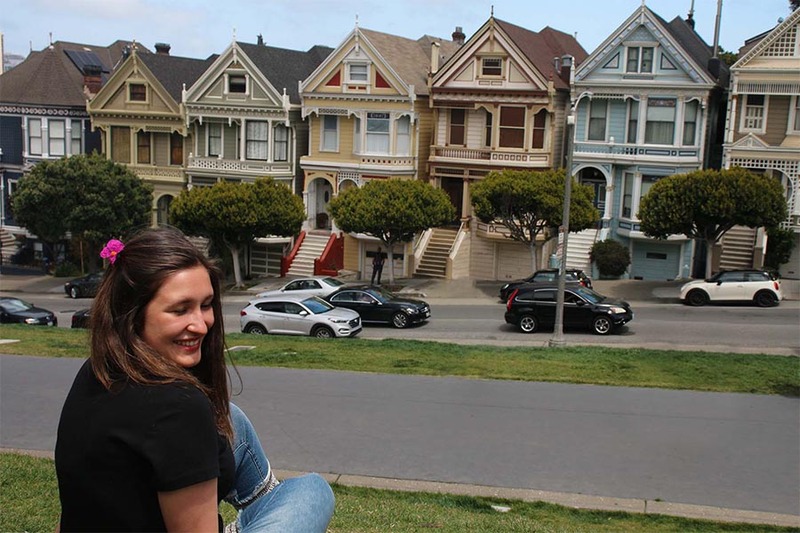 Some of the true San Francisco experiences: have a drink at Top of the Mark in Nob Hill, spend an afternoon at Dolores Park in the Mission, walk along Crissy Field in the Marina … the possibilities are endless, go exploring! It is important to be aware of where you are even when you are on a vacation. Some neighborhoods are better than others. For example, Tenderloin, located right in the heart of the city, on Hyde Street between Turk and O’Farrell Streets, can be dangerous to walk around in. You’re in a city full of new restaurants rated among the world’s best. Don’t just assume they’re all too fancy and expensive for you. In fact, I found that a coffee in San Francisco is cheaper than the one I buy in a much smaller city. And overall, the quantity and quality of food in San Francisco is a lot better even if you are a paying one dollar more per dish. Just don’t stick with Pier 39 restaurants or other touristy neighborhoods. Do some research online or ask your hotel or your Lyft drivers for suggestions. We had the best ramen ever in Chinatown, and really good Indian food in Chaat Corner. Don’t stand in the endless line at the stop on Hyde just below Ghirardelli Square. Just walk up one stop and get on the cable car on the next one. You will save about half an hour of standing in line this way. Look into one of the San Francisco Multi-attraction passes before your trip. They could save you some money if you are planning to do most of the things offered. San Francisco CityPASS includes a three-day Muni Pass with unlimited rides on the cable car, historic trolley and other public transport, along with admission to several attractions and a San Francisco Bay Cruise. This one comes from personal experience. Even though it can be windy and cold, you should wear sunscreen. The first day I didn’t think of it and my face was red as a beet by the end of the day! What you may not know is that budget airlines like Southwest, Spirit and Frontier don’t participate the fare-comparison sites. Check their prices separately by going directly to their websites. We flew to San Francisco round trip with Frontier for under $200 round-trip. There are definitely some details to flying on budget airlines that you should consider, but overall it’s a good value deal if you are a money-conscious traveler. Tell Me: Did I cover it all? Do you have any other advice to add to this San Francisco city guide? Share it in the comments below! San Francisco Attraction Pass: Is CityPASS Worth It? Haha yes SF is sooo hilly. Love that city. Yes to the weather! I went in July with only a pair of jeans and a light jacket and the rest was shorts and tank tops. We have pictures of us FREEZING holding cups of hot cocoa outside on the 4th of July! It looks incredible, I’d love to go someday! My husband and I tackled Yosemite earlier this year and flew back home out of San Francisco. We barely had any time there, but I’ve convinced him to go back! This will be so helpful for planning! Haha, you sound like me when I’m planning a trip somewhere, research research research! Thanks for the insight on San Fran adventures! I’d love to go back one day! Great tips! I did not know a lot of these. And I love the tip about the heels … lol! You know the best cable car tip! I used to take the cable car home from school (sf is my hometown!) and getting on one stop from the main hub saves SO much time! Many of these tips like the ones you shared here were very beneficial for my trip to San Francisco. I know I can come here and learn a lot more from on my future travels!